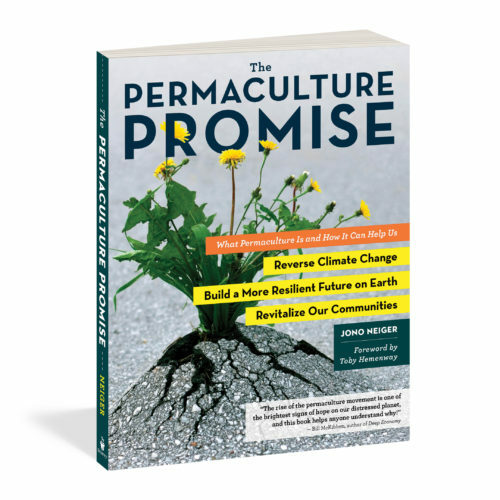 We are very excited to announce that Jono Neiger, one of our founding partners, has a new book out – The Permaculture Promise – that is available for pre-order now! The book offers an introduction to permaculture, as a design system that offers practical ideas for how humans can simultaneously provide for ourselves and regenerate the world. In it are 22 examples of ways in which permaculture has helped to achieve this goal, brought to life through profiles of the people and communities who are already taking the permaculture path – including an urban dweller who tore up her driveway to create a vegetable garden and a California housing development that dedicates a third of its land to parks, orchards and gardens.